This page provides a brief summary of some of the enhancements that have been introduced into MYOB Exo software during 2016. It is important that you arrange for Communicat to update your software version so that you can benefit from new and improved features and also to ensure that your system is compatible with new operating system and software versions e.g. Microsoft Windows versions and application software. If you would like to improve the functionality of your system and/or to update your system please contact Communicat for a chat. In 2016 MYOB have continued their investment in Exo Business across new features, enhancements and essential product maintenance. Further extending the core functionality and extensibility capabilities of Exo Business and integrating new and innovative MYOB provided cloud based services. Improved handling of kits in Job Costing, allowing users to bulk move lines from the grids in to a kit. Document management functionality has been extended to Inwards Goods Receipts, Inwards Goods Costing and Works Orders. Business Alerts now support sub-rules and composite business alerts, providing mechanisms for complex workflow configuration and user control. Deposits can now be recorded against sales orders in Exo POS. Introduces Standard Business Reporting (SBR) features, allowing users to electronically submit a number of different tax reports electronically from within Exo Business including BAS and the Taxable Payments Annual Report (TPAR). NZ GST returns can now be submitted to the IRD electronically via the GST return window, they also can optionally include provisional tax information and process payments for provisional tax along with your GST. The purchase order entry screen has been redesigned, making it more powerful and flexible. The grid now supports copy & paste, hiding & reordering columns, the ability to add & control extra fields and use search templates. Stock Search Templates are now available when searching for stock in the Purchase Orders window. Clarity’s print to file feature has been redesigned making it easier to produce XLS data files with better alignment of rows and columns. Exo now displays the appropriate currency symbol for amounts in all relevant common windows. The user interface design is now cleaner and easier to use in response to feedback from our users. The windows controls have been enhanced to allow for heavy system users to better manage and switch between common tasks. Forms have been redesigned to benefit from widespread use of larger and higher resolution monitors. Business Alerts can now be configured in a range of new areas including Stock, Debtors, Creditors and GL. Extra field limits have been increased from 24 to 38 for each screen. Exo now optionally verifies ABNs of your suppliers & customers against a live ATO service improving data accuracy. The GL report writer has received numerous improvements which provide more flexibility when designing reports, such as %-based comparison columns, drill down to source GL accounts and grids for further analysis. Support for Tax Inclusive Sales order entry and editing. Date range filters (+-90 days) on the activities views have been expanded to +/-180 days. Discount values now obey the discount decimals format settings making them easier to read. 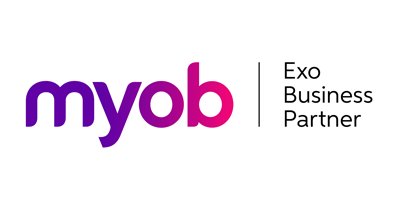 In the past year MYOB have had a focused program of investment in the Exo Employer Services product line that has continued to deliver compliance and legislative updates for Australian and New Zealand businesses including PAYG / PAYE calculation changes and ACC rates and thresholds changes. Lastly, current works in progress that are set to launch in 2017 include further improvements to reporting, with a special focus on employee remuneration and demographic data.